Objective: Endodontic surgery is a standard procedure which enhances the retention* survival rate of many teeth which can not be treated only endodontically (inaccessibility to the apical part of the root by a coronal approach due to posts, root fractures, separated instruments in root canals, calcified and tortuous root canals, dens in dente, , etc.). Endodontic surgery can be applied both to the anterior and posterior regions on the maxilla and mandibula . In posterior regions the surgical procedure is more difficult due to anatomical conditions (maxillary sinus, mandibular canal, number of root canals, inaccessible posterior oral cavity, etc). 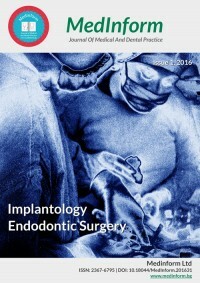 Aim: To present a difficult clinical case where endodontic surgery was chosen as the most – convenient method for treatment because by the routine endodontic treatment is not possible to remove a separated instrument in the periapical lesion. Methods: The endodontic treatment was performed on tooth #36, followed by endodontic obturation of the root canal system. In two days an apicoectomy without retrograde filling was performed. Results: One year after the apicoectomy there is complete healing of the periapical lesion with new bone formation and no symptoms in the patient.